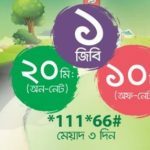 Teletalk Bondho SIM Offer 2017! 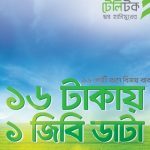 Bangladeshi government mobile operator Teletalk all prepaid customers are eligible for Teletalk Bondho SIM Offer 2017 9GB Free Internet Only Recharge only TK9. Teletalk has come for their valuable customers to enjoy 9GB free internet free and lowest call rate to any numbers. Today I will share for all Teletalk customers to about Teletalk 9GB free Internet. If you enjoy this offer or active 9GB free data with the lowest call rate offer, just read this full article to get enjoy this offer. To check your number of eligibility this offer, please go to your message option and type “Your Number” and send to 112. Example: 015XXXXXXXX and send to 112. 9 GB Internet Free Usable Duration from 12AM to 06AM (up to 1Mbps Speed). All bonus will get after 3 times recharge (9tk). From 30 June, 2016 to stop connection. Bonus will get with 48 hours. 0.5 paisha/sec on net call rate. 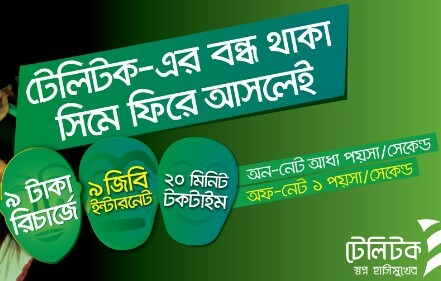 We hope all customers can get know about Teletalk Bondho SIM Offer 2017. Have you any question about this offer, please comments the box. We will try best to solve your problem.Thanks to all customers for stay with us.